Gurim’s Having So Much Fun! What a fantastic few days it has been in Gurim! On Friday night, we had a lovely Shabbat! We sang so many beautiful songs. During ReLiSh (Ruach Lifnei Shabbat-Spirit Before Shabbat) we gathered in circles and looked at ho w lovely everyone was dressed. The highlight was singing ‘Minyan Man,’ a camp favorite. Then, we sang even more during Kabbalat Shabbat and Ma’ariv. The rain stayed away as we enjoyed the outdoors in the lovely Gilboa Amphitheater. After services, we went to the chadar ochel (dining hall) for a delicious feast of chicken noodle soup, bourekas, chicken, and veggies. For dessert, there was chocolate cake! Following a rousing birkat hamazon (grace after meals), all of aydat (unit) Gurim went to the beit ha’am (house of the nation, or the gymnasium) for ruach filled zemirot Shabbat (Shabbat tunes). 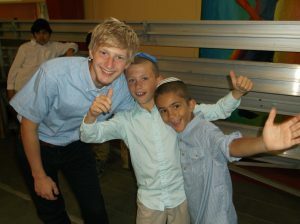 Everyone had a great time singing to their heart’s content on erev Shabbat (Friday night). Saturday was a very peaceful and restful day with much free time to do whatever one desired, and as the day wore on the mood shifted from celebratory to sad. Tisha B’Av was approaching. Together as an entire camp, we spent Saturday night and Sunday reflecting on the collective, troubled past of our people during the 9th day of the month of Av, the day both Temples of Jerusalem were destroyed. Luckily, the mood shifted again, this time from somber to joyful, as M onday was yom Yisrael (Israel day)! 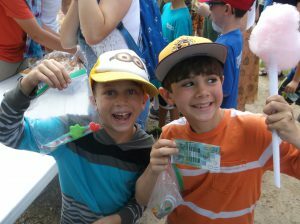 The chanichim (campers) participated in many activities that demonstrated the awesomeness of our shared, historic, and present day homeland. The day wrapped up with a powerful tekes (ceremony) for the glory of our state. In that tekes, the Gurim banot (girls) performed a fun dance, and the whole aydah sang avinu shebashamayim (our Father who is in Heaven), a section of the prayer for the State of Israel. It was VERY cute. Today, we finally have a normal day as we gear up for KTV, the annual lip syncing competition.